LaserGods.com Is Growing By The Minute! Sandra Merritt and David Daleiden outside of a San Francisco courtroom. The two anti-abortion activists are charged with invasion of privacy for secretly making videos at Planned Parenthood meetings. The names of 14 Planned Parenthood workers and others will remain sealed during the trial of two anti-abortion activists who are charged with secretly recording them, a California judge ruled Monday. 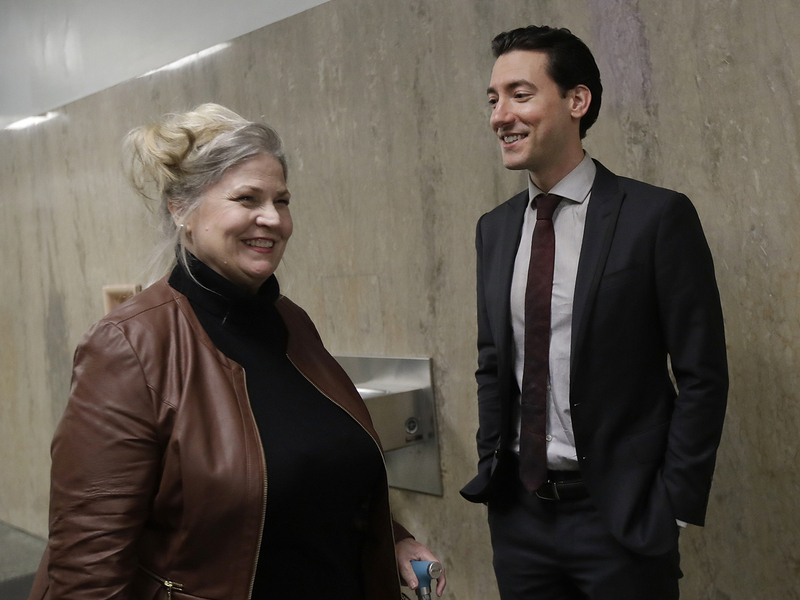 The order by San Francisco Superior Court Judge Christopher Hite came in a preliminary hearing in the prosecution of David Daleiden and Sandra Merritt of the Center for Medical Progress. Hite said that he would punish anyone discovered to have published the names of the workers, which were already ordered to remain secret when Daleiden and Merritt were first charged in California in 2017. The judge's order came after an anti-abortion website published the names over the weekend. California prosecutor Johnette Jauron said it was necessary to keep the workers' names confidential because "they are in fear of bodily harm." Prosecutors offered an affidavit by one Planned Parenthood worker who said that Daleiden sent a text to her phone number in 2016 and said, "I know a lot has happened in the past year, and maybe I'm the last person you want to hear from. But if there's anything I can do to help you, please let me know." Daleiden and Merritt have pleaded not guilty and say that they are citizen journalists whose activities are protected under the Constitution. They are accused of secretly recording videos in 2105 purporting to show that Planned Parenthood workers were agreeing to sell fetal tissue for profit, a practice the group denies. Planned Parenthood says the videos were deceptively edited and that it had only charged medical researchers for the costs of shipping, or other expenses tied to donating the tissue. Planned Parenthood says it has since stopped asking for reimbursements for shipping costs. Planned Parenthood has made the unusual legal demand to join the state's prosecution of the anti-abortion activists. The organization says it is worried about the workers' safety and wants its lawyers to be able to object to defense lawyers' questions that might identify the workers. Daleiden and Merritt each face 14 counts of invasion of privacy. Planned Parenthood filed a federal lawsuit against the Center for Medical Progress in 2016. Last year a federal judge barred the release of some of the videos. FACT CHECK: What’s Happening On The U.S.-Mexico Border?